Another diverse group of bees found in Florida, with over 80 species, is the Apidae family. This group of bees includes many of the more familiar bees, like honey bees, as well as carpenter bees and bumble bees. 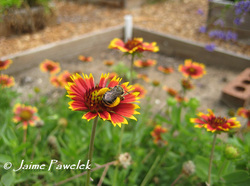 While honey bees are not native to the U.S., we do have many other native bees in this family. 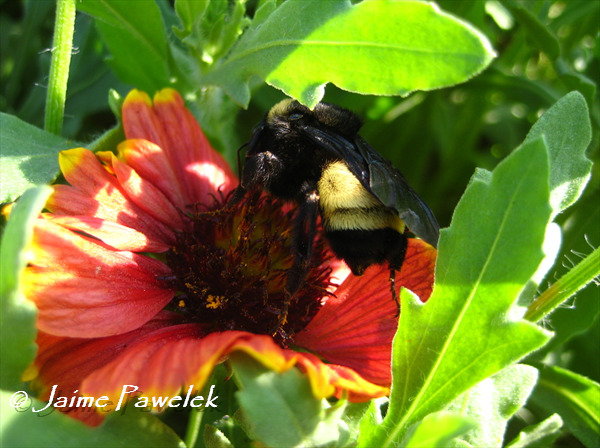 Bumble bees are familiar to most, with their large, fuzzy, black and yellow striped bodies. They are often heard before they are seen, with their loud buzzing. 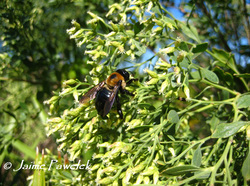 Florida is home to several bumble bee species. 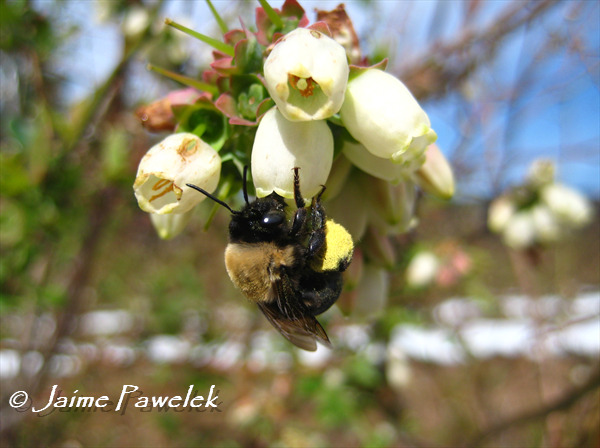 Bumble bees are the only social bees found in North America. In early spring the queens awaken from their hibernation and begin the search for a suitable nest, often in abandoned rodent holes or under a tussock of grass. They then begin foraging for nectar and pollen from the earliest flowering plants (redbud, yellow thistle, flowering plum, and citrus). They lay a few eggs with the provisions they have collected and when they emerge, they become her first worker bees. These bees then set out in search of nectar and pollen so the queen can stay back at the nest and lay more and more eggs. The colony grows throughout the year, and becomes it's largest at the peak of summer flowering, then begins a steady decline with the decline of flowering in the fall. The queens will mate again in the fall, or lay a new queen to take over and she will mate in the fall, waiting for the spring to come around and begin the process all over again. Bumble bee colonies do not make enough honey to be harvested, like honey bees. They only make enough to support their colony. Another bee, familiar to many homeowners, is the carpenter bee. 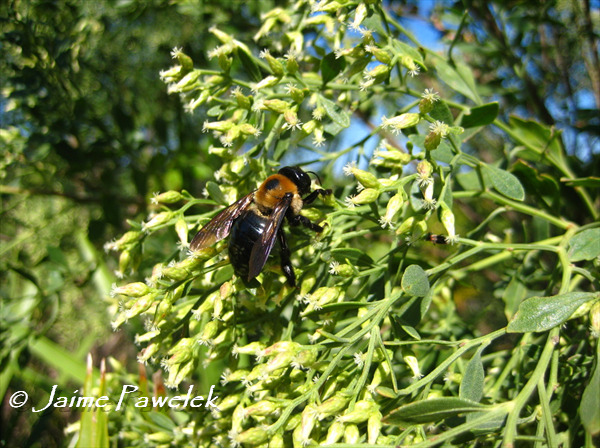 Two species of carpenter bees can be found in Florida, Xylcopa virginica and X. micans. Female carpenter bees excavate their nests in wood. They use their mandibles to tunnel into the wood, not eating the wood, but discarding it (often leaving a small pile of sawdust under the nest entrance). They will, however, use the chewed up wood as partitions between cells in the nest. 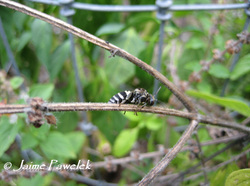 Some people consider them minor pests because of the holes they drill in their trellises or eaves, but they should not be punished as they are valuable pollinators in wild and urban garden habitats. 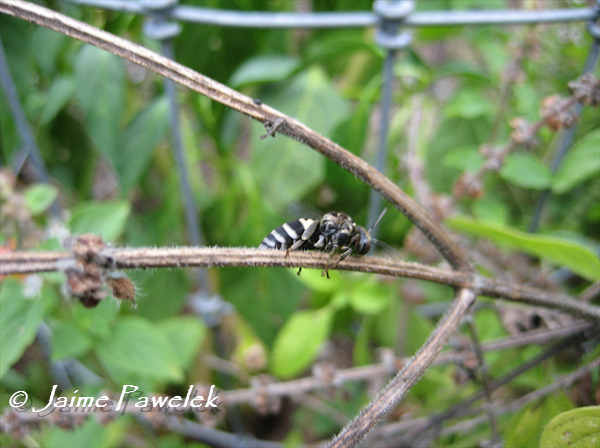 There are also a few species of small carpenter bees, Ceratina spp., that can be found in Florida as well. These small bees (about the size of a grain of rice) nest in pithy plant stems that they hollow out. Several other common bees are found in the Apidae family including long-horned bees (Melissodes and Eucera spp. ), the southeastern blueberry bee (Habropoda laboriosa), and sunflower bees (Svastra spp.). The females of most of these bees have very hairy back legs, that make them look like they are wearing leg warmers! The males typically have unusually long antennae and can be seen sleeping in clusters on flowers. Since they don't have nests to go home to, they find a branch or flower head to congregate on. At night they cluster together, but during they day they are fierce adversaries dutifully defending their floral territories. Several species of cuckoo bees belong to this family as well. These are found in the genus Nomada, Epeolus, and Triepeolus. They parasitize the nests of other bees and act much like cuckoo birds. Triepeolus parasitize bees in their own family including Melissodes, Svastra, Eucera, and Xenoglossa spp. Nomada are known to parasitize bees in the genus Andrena, and Epeolus parasitize bees in the genus Colletes. These bees are often more sinister looking than their counterparts as they are less hairy and more wasp-like in appearance.